I recently updated the FIB-U-LATOR app to have more excuses, and I’ve decided to add another update, only this time I am going to add support for expanded features that require the use of the SQLite Database available to the app in the SDK. Getting data out of the database is pretty easy actually, and it really doesn’t take much code to connect to, then retrieve data. Here’s a quick tutorial over at dBlog, but I’m getting ahead of myself. Since I work with MSSQL all the time at the day job, I’m really accustomed to having a nice GUI to do all the work of creating and managing my databases, and I really have no inclination whatsoever to do any of those tasks at the command line. None at all, no thanks. 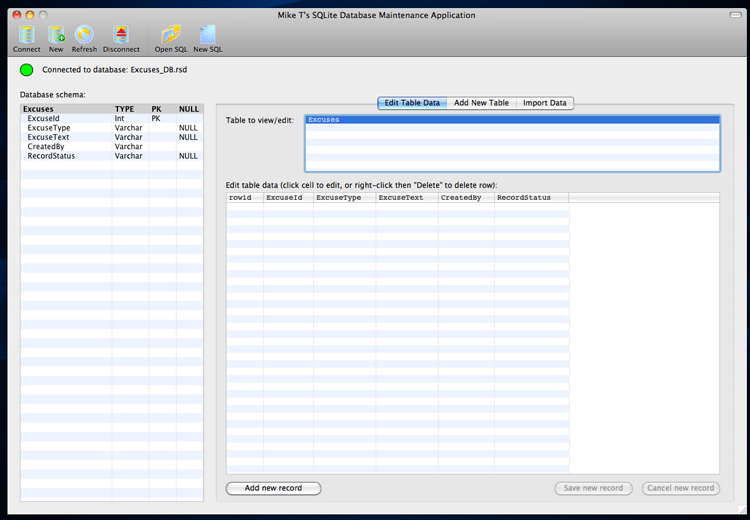 It didn’t take me long to find this simple, easy to use GUI called MikeT’s SQLite Database Management Application. It is very basic, and simple, but you really don’t need anything more than that. It’s fast, simple to figure out, and jammed with a bunch of options. You can add encryption when you create the database, and has a dropdown to select the column data type while adding new rows to the table, you can even import data from a tab delimited file to create a new database. I have some work ahead of me to get my current data into the new database yet, and ideally what I would like to be able to do is convert the plist file to a tab delimited file and just import it. Right now, I’m not sure how to do that. EditiX seems like it’s a good option, but I haven’t tried it. 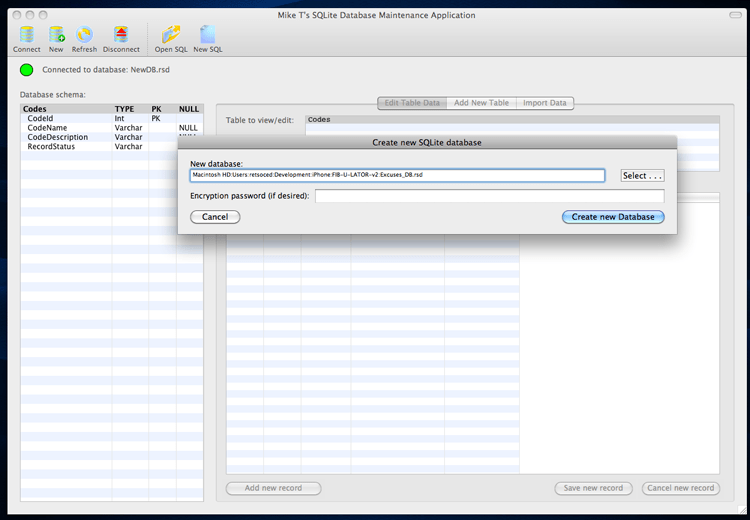 There’s also a big list of XML editors for OS X at XMacL. Oxygen XML Editor seems like a really powerful option, but it’s a bit pricey at $350.00 for a single license. I’d rather hand-jam all of the entries than spend that kind of scratch for an app to do it, I only have a few hundred entries anyway, so it wouldn’t be a horrible march of death to get it done the hard way. More to come as I get further into this.